Modern games, or at least their designers, think you’re rubbish. They look down their noses and shake their head in dismay at your abysmal skills and woeful grasp of game mechanics. In fact they think you’re so terrible at a new game that they need to take you by the hand, and slowly lead through the first section pointing out what to do and how to do it. So low is their faith in you, that they sometimes even make it impossible for you to fail, impossible for you to die, impossible for you not to lean what you’re supposed to do. They are right of course, you are rubbish. Why wouldn’t you be? You’ve never played this game before you only booted it up seconds ago. How are you meant to know what button does what? In a world of free-mium disposable games, it only seems right that you’re shown the way when you start. After all if you don’t enjoy that first 5 minutes you know full well you’ll be deleting it and moving on. Oh, Look at that sky! Some older games meanwhile think you’re amazing. They know you don’t need to waste time on easy nonsense and gentle baby steps. You’re a gamer, you’ll know what to do it’s in your blood. Years ago you played something similar, that’s enough preparation, enjoy the challenge hotshot. You start the game, you play 30 seconds and you die. Next go, you push yourself, concentrate hard and last 40 seconds. After dozens of attempts, maybe you’ll grasp the ideas or maybe you’re lasting a minute but that doesn’t matter, you’re being challenged that that’s why you’re playing the game. 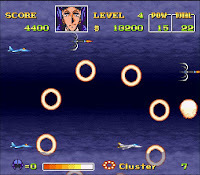 when it came to shooters I always opted for the ship to either move up thescreen or into it. 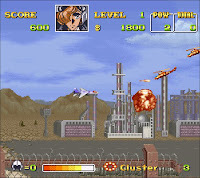 One game I knew to be very good, but never really experienced though was UN Squadron. I think I knew of it from the anime characters (the game actually is based on Kaoru Sintani’s long running manga and anime series called Area 88). again. It’s a graceful way of giving the player an energy bar without removing the element of immediate danger that is essential to a good horizontal shooting game. It lessens the frustration but maintains the tension. Another noticeable way UN Squadron escapes the confines of its genre is the inclusion of what can best be described as RPG elements. Each time the player picks up a specific object (dropped by red enemies) for example they increase the level of their ship, much like an RPG levelling up system. Performance in stages also earns you XP in the form of money. Then much like in the anime, the pilots can spend this money between missions on weapons and different planes. 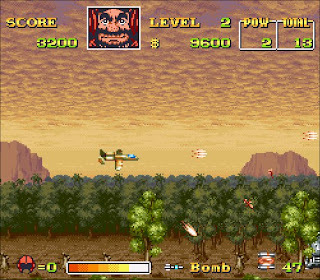 Each plane and weapon have their own attributes and skill trees, so the player can really tailor the experience to suit their individual play style. First purchase for me always is the F20 Tiger shark, as its homing missiles removes the huge problem that plagues most horizontal shooters – enemies sneaking up from behind you. It’s worth spending time reading about the planes before spending your hard earned XP though, as unfortunately the amount of money you get from shooting opponents seems disproportionate to the amount you need. With each level only being playable once, it is near to impossible to earn enough money to buy the best planes or upgrades. This coupled with the fact that some bosses, require certain abilities (that not all planes have) to be destroyed presents you with a situation where it is actually impossible to finish the game if you bought in the wrong areas. Even ignoring this insurmountable difficulty wall, the rest of the game is notoriously brutally hard even on easier settings. 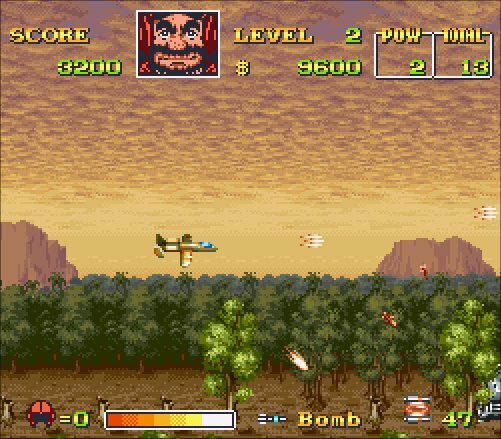 The Danger meter may add a safety cushion, but in the final stages even with it missions can last just seconds as the volume of enemies on screen (and the amount of slowdown) is just too great. Yes it may irritating having to reply the first level, but the unusual (for a shooter at least) map screen mean that after that the game is open enough to keep each play-though different and distinct. 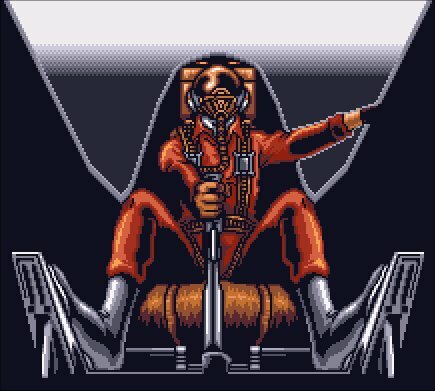 The journey may be hard but it is certainly attractive and for me UN Squadron holds the honour of most attractive skies in any 16 bit game ever. From flying through clouds admits a thunder storm, to sunsets with seemingly infinite layers of parallax scrolling, UN Squadron really does have a sky to suit every mood. The sprites may not be able to measure up to the backgrounds but that’s not to say they are detailed and well animated. 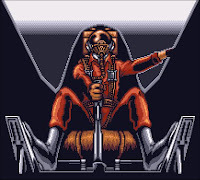 The missions too are varied, from fighting in the air to taking on submarines, land carriers, stealth bombers and going up against screen filling bases and titan crafts. 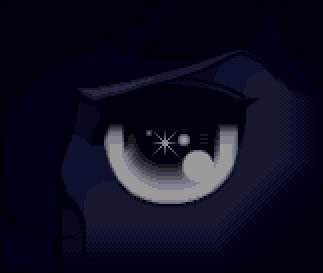 The always popular flashyness of Mode 7 makes a fleeting appearance, but thankfully this is limited to an opening sequence and feels integrated adding to the antithetic. The music too, is catchy and rich; a joint collaboration between Toshio Kajino, Mari Yamaguchi and Yasushi Ikeda. Significant because they also worked on various Mega Man games between them. It certainly echoes this series, though doesn’t manage to reach that level of audio perfection. I’d be lying to say I am anywhere near finishing UN Squadron, even after dipping in and out of it for several months. I’m certainly better than I was, being able to romp through the first few levels with relative ease. But be aware, if you are buying this game with the sole goal of completing it you will need to invest a great deal of time memorising attack patterns and calculating how best to spend your accumulated in game money. I wish I had the time to devote to it, as I imagine it’s very rewarding to finally crack the game. I’m sure I will one day, as (much like Pop N Twinbee) there is a ‘pick up and play’ appeal. 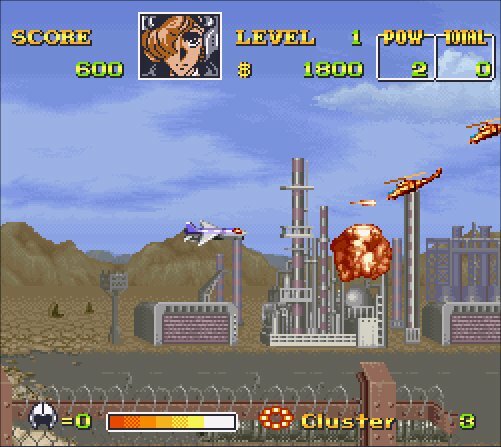 It’s also interesting that I keep coming back to UN Squadron to attempt to finish it, rather than my approach to Parodius which was very much an aimless chill out experience. They are both horizontal shooters, but it is perhaps the more serious nature of UN Squadron that makes it feel more like it’s a game you need to sit down and focus on. Obviously Parodius’ infinite continues makes it impossible not to finish, where as UN Squadron is for me at least close to impossible. I’d love to see the end, but fear it may take many years before I ever did. It’s odd to think I like a game that seemingly hates me. I have the inability to put it down, even though I know failure is inevitable. It just goes to show that sometime you don’t have to be good at something, to enjoy and appreciate it. Where did I get this game from? recollection of the next morning. Clearly one night I saw UN Squadron listed for £17.99 (including p&p) and thought that looks like a great deal. I must have only been semi awake though, as it came without instructions in a slightly tatty box. I don’t know if for that price I should be thanking my daughter for giving me the chance to grab a bargain, or kicking myself for letting imparted judgement rule my wallet. Experiencing UN Squadron also prompted me to have a watch of the 2004 Area 88 anime reboot and dubbed and subtitled episodes can be watched on YouTube. It’s nothing spectacular, but certainly not offensive. It’s also nice to know a bit more about the characters you’re playing in the game, even if you have to seek that information out from other media.